Note: All photos are Copyright 1997 by John Farley or Alice Petry. You may download them for your personal use, but any other use requires permission. My fiancee, Alice Petry, and I headed out from Edwardsville, IL (20 mi. NE of St. Louis, MO) at 9:30 a.m., both of us excited that she was joining me on a chase for the first time. Our target area for late afternoon was northeast Oklahoma, generally in the area to the north of Tulsa. This area appeared to be prime for severe weather in the afternoon, as the dryline was expected to be forced east by an approaching low into very moist air over that area. Southeast Kansas was also progged moderate risk by SPC, but I thought our chances were better in Oklahoma as models predicted higher CAPE values there with equal or better lifted index and dewpoint values. We headed down I-44 and turned west on 20 at Claremore OK at 4:00 p.m. At this time there was evidently good wind shear as the surface wind and low clouds were coming from the south, with higher clouds moving from the southwest. However, we had neither reports nor visual sighting of any storms in our target area yet, so we proceeded west hoping to meet up with storms as they developed ahead of the advancing dryline. We got word via KMRG AM 740 in Tulsa of severe then tornadic storms southwest of Oklahoma City, suggesting to us that the dryline had not advanced as far east as had been progged earlier. I decided we needed to get west faster, so we cut south on 75 to the 412 expressway in Tulsa and headed west from there until 412 turned into the turnpike. Because I was concerned that we might get caught with no options to change direction in the long stretches between exits on the turnpike, we opted to head south on 48, then headed west on 51 at 5:20 p.m. It became increasingly cloudy; no way to see cloud tops but as we approached Yale we saw what seemed to be updraft base, then a rain shaft to the southwest. We made a brief pit stop there and at that time it appeared that a line of storms might be forming just over us. At 5:40, deciding that we ought to stay ahead of that band, we headed back east. A few miles east of Yale I had to hit the brakes suddenly as a huge turkey vulture swooped down a few feet in front of me to get something dead in the road. At the same time, Alice hollered "snake!" and said there was a huge snake going onto the side of the road. I looked in the mirror just in time to see a snake at least 4 feet long entering the road behind us from the shoulder. Apparently it and the vulture were in a near-suicidal race for the road kill! Turning our attention back to the storms, I decided we should head south and see if we could see anything on the trailing end of the band. We proceeded south on 99 through Dilton, and soon had sun and clear sky to our southwest. Deciding we had passed to the south of the developing storms, I stopped again to think about what to do. We were hearing more and more tornado warnings and reports of actual tornadoes from the storms south of OKC. I considered trying to run south and intercept them somewhere near Seminole, but this seemed like a long shot - we might not get there before they did, they might die out by the time we got there, and/or we might run out of daylight. I decided our best bet was to turn back north and follow whatever may or may not have been developing near Yale. This was at 6:10. As soon as I did this, I was both pleased with my decision and annoyed with myself for getting so absorbed in the radio reports that I didn't look carefully at the developing storm to our northwest. It now had a high, slightly backsheared anvil, with a rock-hard updraft tower underneath! I said "that's our storm!" and after we passed through Dilton, I could see RFB to the west, brightly backlit and orange underneath from the lowering sun behind the storm. Ahead was an area of heavy precipitation. 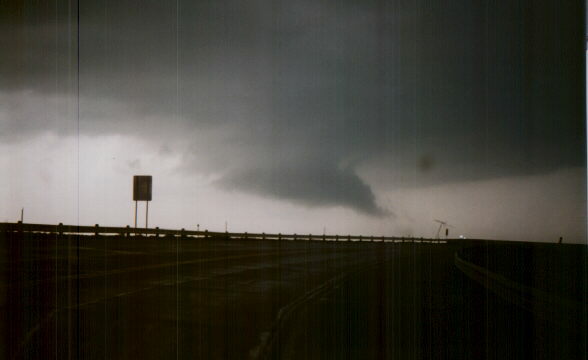 Before we were back to 51, I could see a lowering beginning to form, and by the time we crossed 51 there was a definite wall cloud. Since the meso was clearly moving north or northeast, I wanted to stay headed north on 99. The area was hilly and wooded, so we could not stop as soon as we liked. But about halfway between 51 and Jennings, we found a nice open spot where visibility was fairly good, so we stopped to watch, photograph, and videotape around 6:20. 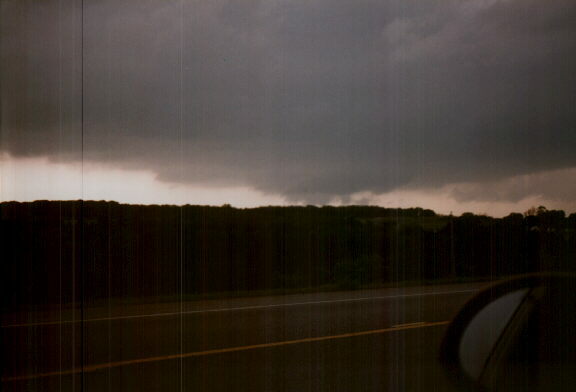 By now, there was a narrow lowering halfway to the ground, and as I started to tape, I announced "We've got a funnel." After looking at the tape I'm not so sure, because I cannot confirm from the video that there was any rotation at this point, though there was later. Hence, I'd classify this only as a "possible funnel." Alice took an excellent picture of this feature showing the lowering, the updraft tower above it, and the intense precipitation shaft to the right. I do think we had several brief funnels over the next 20 minutes or so, and we certainly had an awesome series of brightly backlit wall clouds, which at times were definitely rotating. 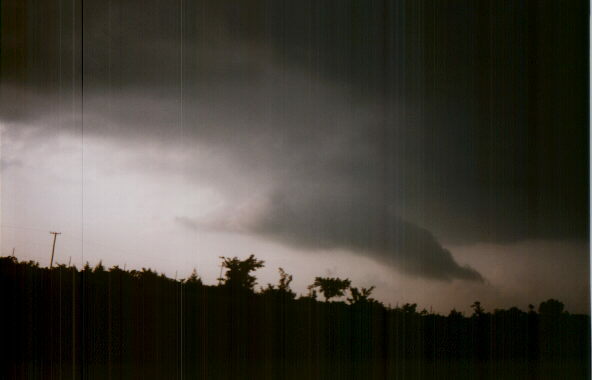 The storm produced a series of three wall clouds, the first two of which rotated at times, and also reached two-thirds of the way to the ground at times. The shear was very visible - the base of the meso was moving almost due north, while the downdraft area moved to the northeast and (as later viewing of satellite photos confirmed) the anvil blew off to the southeast, eventually reaching Arkansas. In fact, our ability to move closer to the meso was limited because it was making northward progress faster than the precipitation core, which I obviously did not want to drive into for fear of large hail and because of lost visibility. This shearing process resulted in the wall clouds getting split off from the core, only to have new ones form closer to the core. We watched and taped for about 10 minutes at our first stop, and for the first 2 or 3 minutes both of us noticed a steady loud roar (you can hear it on the video, too). I have always associated this sound with a tornado on the ground, which this was not - can violent motion in a wall cloud or funnel cloud also produce this sound? (Or could this have been the same kind of "hail roar" that was observed the same day by Roger Edwards on another storm much farther south?) It definitely was not thunder, though we did get occasional thunder from CGs in the precipitation shafts to our north. As the meso moved north, we moved to a new position just north of Jennings and taped the second wall cloud. It was very wide and solid at times, and appeared to reach the ground - looks like a large tornado in this part of the video. However this was an illusion caused by a hill to our west. As it got to the north of this feature, we could see that there was still a gap between the lowest part of the wall cloud and the ground. At this point, the video shows clear rotation. Around this time, I paused briefly from videotaping to take this picture. 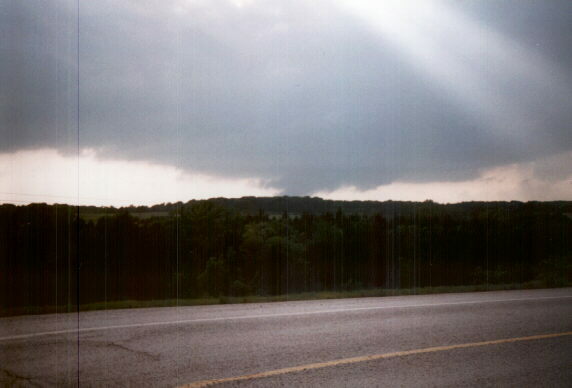 In a few more minutes, the wall cloud began to get shallower and shallower until it was indistinguisable from the base. After about 10 minutes at this location, we moved north again to where 99 passes over the turnpike, and stopped again. A new wall cloud formed, but I soon noticed that what had been an intense precipitation shaft had now dwindled down to nothing. This wall cloud was under a towering cumulus that was producing little or no precipitation, as the anvil and any lingering precip underneath broke off to the southeast. 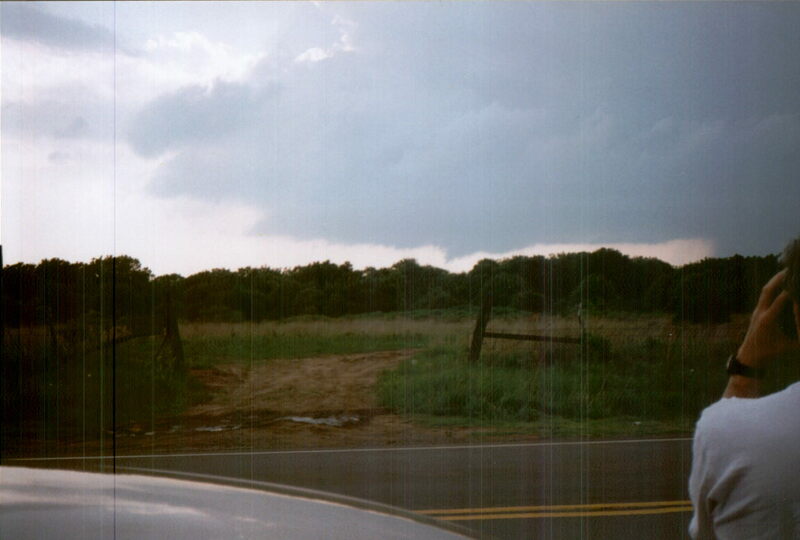 We followed this third wall cloud, which never rotated so far as we could see, to the north to where 99 joins 64. We followed these roads east into Cleveland, where we decided to stop and grab a quick sandwich at a Subway shop when we arrived in Cleveland at 7:15. The wall cloud had nearly disspated, and the towering cumulus had not substantially glaciated. The whole thing appeared to be weakening. Since it had only moved about 15 miles to the northeast in an hour, we figured we could easily catch up with it if it regenerated. (After the Illinois storms I'm used to chasing, this slow movement was a real joy!) It briefly looked like it was going to regenerate, but by 7:30 the whole cloud had disappeared. We did now see a spectacular storm far off to our northwest. But I knew we couldn't get anywhere near it by dark. The chase was over. We headed to Tulsa, checked into the Super 8, and turned on TWC. Their crew, chasing with the Doppler on Wheels group, had taped a tornado in Harper County, KS. That was the storm we had seen to our northwest. The 10 p.m. news on channel 2 in Tulsa had video of one of the tornadoes in southern Oklahoma, and TWC later showed another. Channel 2 also showed video of the same wall cloud we had watched. Why did our storm not produce a tornado when the others far to the northwest and south did? I think the answer is that it was too far ahead of the dryline to have the kind of sustained lifting mechanism that the other storms closer to the dryline had. There was so much shear in the air that our storm quickly begain to rotate, and its structure viewed vertically looked like a classic supercell. But absent a sustained lifting mechanism, that shear took it apart after about an hour. We knew about the storms in southern Oklahoma but, as noted above, did not think we could get to them. We did not know about the Kansas storms, and I incorrectly guessed that our storm had been closer to the dryline or to the front to the north. If we had known the position of the Kansas storms we would have known that our storm was ahead of the main action, but I am not at all certain we could have gotten to the Kansas storms before dark. As it was, we were on the only storm that broke out in the north half of Oklahoma before dark. And even without a tornado, the video is probably my personal best, with the wall cloud brilliantly and beautifully backlit. I got more than 15 minutes of this on video. So even though we missed the tornadic storms, I'm pleased with this chase and learned a lot from it. And Alice wants to go again, even though she's not the weather weenie I am and would probably not, on her own intitiative, drive 1150 miles in 2 days for 55 minutes of watching wall clouds! Coming back the next day, we hoped to catch some of the storms predicted for southern Missouri. But we had to be home by around 8:00, and again, the storms developed late in the day, and they did not cross into Missouri until after dark. We turned off 44 a couple times to look at promising-looking towering cumulus south and southeast of Lebanon, but they sheared off before they could substantially glaciate. As we crossed the slow-moving back door cold front, the temperature fell from the mid-80s in Joplin to the mid-50s with drizzle when we got home.